Mortal Engines is a confusing movie. I mean what does the title even mean? I was all but certain somebody would explain what it meant during the two-hour-plus movie, but nope. My best guess is that it refers to the people operating the roaming cities of the future, the tiny instruments of flesh and blood that have become the gears to these monstrous mobile cities. That’s only the start and it’s simply the title. Mortal Engines is the latest in dystopian YA to make the leap to the big screen, but this time with the guidance of Oscar-winning blockbuster maestro, Peter Jackson. If anyone could elevate a YA novel into big screen eye candy, it has to be Jackson and company, right? In the distant future, the world we know it was decimated by a war that took all of 60 seconds. In the ensuing years, cities have taken on a new life. They have become mobile and roam the land, swallowing and attacking other smaller cities, and the most notorious is London. Tom (Robert Sheehan) is living a blissfully ignorant existence on London until he runs into the scarred, feisty Hester Shaw (Hera Hilmer) who attempts to kill Valentine (Hugo Weaving), accusing the leader of London of killing her mother. Tom hears too much, and Valentine tries to dispose of both of them while he can also assemble a weapon from the old world to gain total supremacy. I think the good slightly outweighs the bad when it comes to Mortal Engines, but this is definitely a sci-fi action blockbuster where the sum fails to weigh more than its moving parts. The world building on display is more imaginative and intriguing than I was expecting. I was expecting a PG-13 steampunk Mad Max and I got a larger, more developed, weirder and wilder world. Early on, the opening sequence gives a sense of the dangerous reality of predatory cities, and it’s thrilling and large-scale. Immediately you understand why Jackson and company wanted to tell this movie on a big canvas. From there, we get a better sense of how the world has rebuilt itself in the ashes of our civilization and how others have adapted. If London is the scourge of this new world, others have taken to hiding, eking out fragile lives on the fringes of this society. That leads to smaller moving buildings designed to hide. This leads to the skies being an escape from the earthbound cities. This leads to outer reaches where slave auctions occur. This also somehow includes zombie cyborgs, which I don’t quite follow how a world of giant cities that covets “old tech” somehow has conquered life and death, but hey. With each new location, the world got a little bit bigger, and it was already plenty big to begin with. That’s something that Mortal Engines has in spades – a sense of scale and scope. The visual grandeur of the film is expansive and richly detailed, pushing the outer boundaries just a little bit further. There’s a fun chase scene through a city as it’s sliced and diced into smaller parts by grinding gears and sparking saws. The budget was only $100 million but it looks like it could have easily been double that. 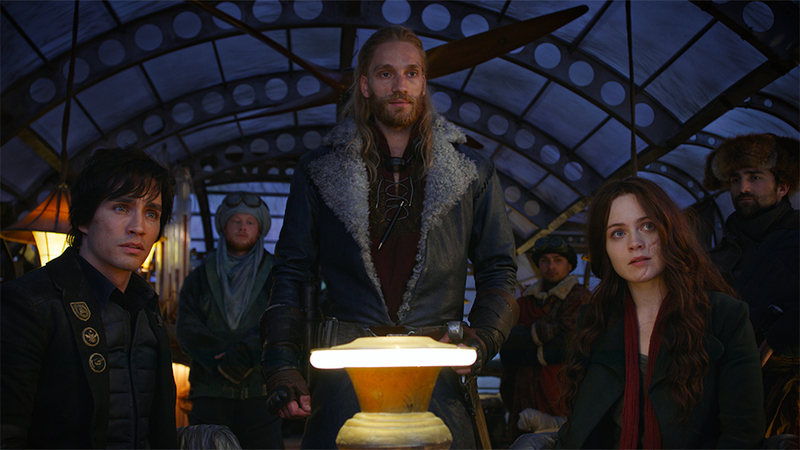 Even at its worst, Mortal Engines is a visual treat that surprises with ingenuity and terrific special effects. The good is drowned out by the messy, bombastic, ridiculousness that takes flight. This is a big, dumb movie that readily announces itself as big and dumb. The dialogue is often cheesy and occasionally painful, with characters spouting self-parody lines like, “I’m not going to tell you my sad story,” and then 30 minutes later, “So that’s my sad story.” It’s the kind of movie where every character seems to be angling for that movie quip. One character says, “I’m not known for subtlety,” which could have been the message of the movie as a whole. Another character says her name relates to her desire to have her ashes scattered by the wind upon her death. Guess what doesn’t happen at all? My friend Cat McAlpine wrote in her notes for the movie, “Why is the dialogue so bad?” four separate times. There’s one moment late where a character with a bowler hat is shown and it’s meant to be played like some big moment of leverage or betrayal (“Oh no, not Bowler Hat Man!”) but I don’t recall any scene establishing who this man was or his connection to the Mayor of London. It’s just like a man in a bowler hat appears and the movie treats it ludicrously seriously, and I wanted to laugh uproariously. It was not the only time I felt this impulse. It’s never boring even when it’s being patently ridiculous and dumb. The main characters are powerfully bland, and they also give way to bland supporting friend characters who serve no purpose other than to be the eyes needed to oversee certain villainous revelations. The romance between Hester and Tom is nonexistent and painfully contrived. Much like the equally bonkers Jupiter Ascending, the main characters and their story are the least interesting parts of the world. Sheehan (TV’s Misfits) seems a bit too old to be playing a 16-year-old. Hilmar (DaVinci’s Demons) has little to work with but is very leaden and flat. There’s no spark of charisma between the two of them. Hugo Weaving (The Hobbit) is clearly enjoying himself as the hammy villain bent on bringing back old imperialism into this brave new world. The entire population of London is only seen cheering in reaction shots, which makes it harder to believe when characters talk about innocents amongst this throng of happy imperialist cheerleaders. I was happy to see Frankie Adams (TV’s The Expanse) as a do-nothing role as Revolutionary Fighter Pilot #3. There is a massive plot hole in the second act that Mortal Engines cannot recover from (minor spoilers). The entire motivation for Hester is her vengeance against Valentine, enough so that she’s willing to risk her life by running out on her zombie Terminator surrogate father Shrike (Stephen Lang, in CGI mode) to see this through. But if Hester has a zombie Terminator surrogate father, why doesn’t she simply say, “Hey new dad, help me kill this one evil guy, and I’ll happily do whatever you want after”? In flashbacks, we see her open to the idea of transforming into some form of a robotic hybrid, shedding her humanity and losing the ability to feel any pain. It makes no sense why she wouldn’t use this new asset to her advantage, especially when the second act is mostly spent proving how formidable a threat he can be. This plot turn is further evidence at how sloppily the storytelling can get with character choices. Shrike is introduced as another antagonist to chase our heroes, but by introducing him at all, it makes me wonder about the better version of this movie, the Leon: The Professional version where a young girl teams up with a zombie Terminator father figure for vengeance. Don’t you, dear reader, want to see that movie too? It already sounds far more interesting and a better use of the unique story elements. Here’s another example of how confusing this movie is – the poster image. Go back to it in this review and study it, then ask yourself why the marketing team decided to put the visual emphasis on a woman’s face covered by a bandanna. It’s a movie about giant cities on wheels attacking each other and it also has a zombie Terminator… and the emphasis is on a bandana? If all you saw about the movie was the title and that key poster image, you would never suspect what kind of movie you were in store for, which seems like the exact opposite purpose of advertising. What’s the hook of this image? What’s underneath that bandanna (spoilers: a second smaller bandanna)? What about the tagline which talks about her scar? Did the marketing team actively try and hide the buzzier genre elements? 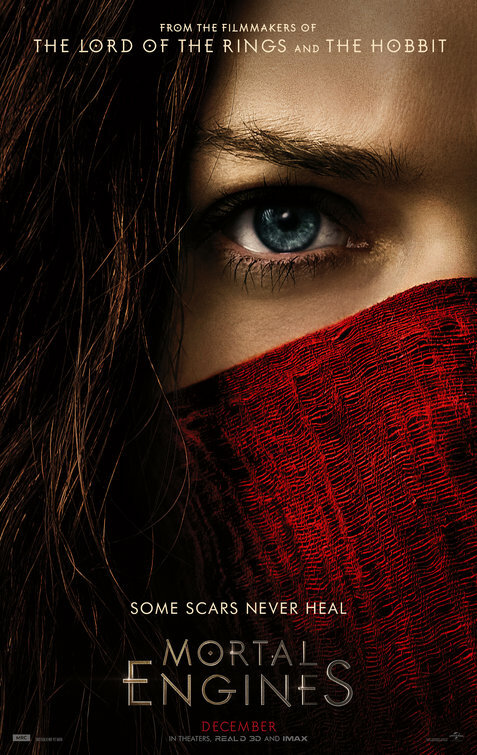 Mortal Engines feels assembled from the many scattered pieces of other, better movies. I wish we spent more time in this world and less time with the bland assembly of characters not played by Hugo Weaving. I wish we saw more about the intricacies of life on the move and the working infrastructure of these new environments. 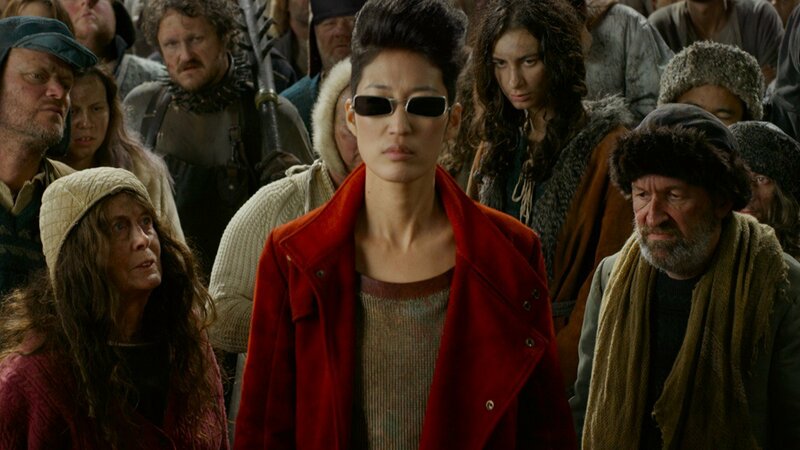 I wish we had more importance with the Anna Fang (Jihae) character where she didn’t feel like she just ported over from a Matrix sequel. I wish a lot of things were different about Mortal Engines and yet even when it’s bad, even when it’s dumb, and even when it’s insane, the movie is always worth watching and fairly entertaining, for a variety of reasons. I could see a select group of audiences enjoying this for ironic and non-ironic purposes. It’s a big shambling mess of a movie but it puts on a solid show.